Project: This website was created to showcase Barry's writings, blog posts, reviews, and photos and let fans know about upcoming appearances. This was done by combining different about modules, a blog module, and left and right hand side navigation. 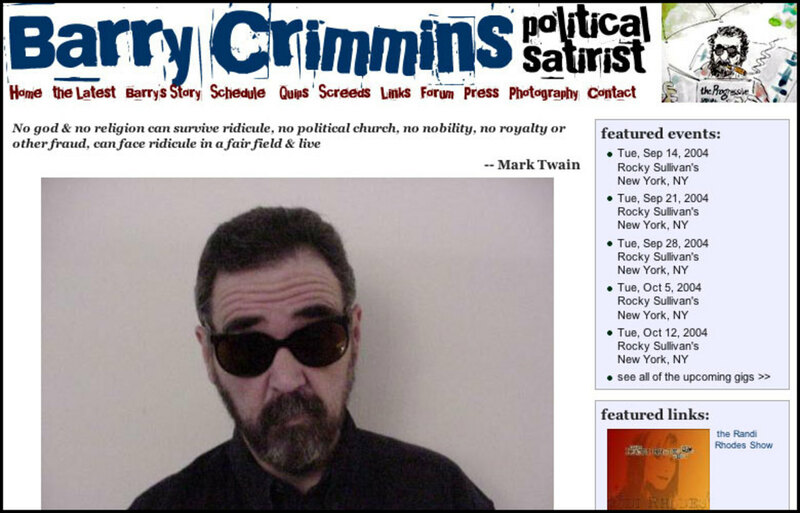 Summary: World famous political satirist Barry Crimmins. Make sure to see his very extensive "Quips" section, from website "Former Air America Radio writer and correspondent, internationally renowned political satirist and author of the acclaimed Seven Stories Press book Never Shake Hands With A War Criminal helped bring the Boston Comedy scene into the modern age when he founded two of Boston's most fabled clubs: The Ding Ho and Stitches. Such acts as Steven Wright, Paula Poundstone, Bobcat Goldthwait, Kevin Meaney, Jimmy Tingle and many, many others cut their comedic teeth in the rooms Crimmins started and at shows he produced."